We chose to raise Berkshire hogs because of their world-famous meat quality and their suitability to a small farm operation. 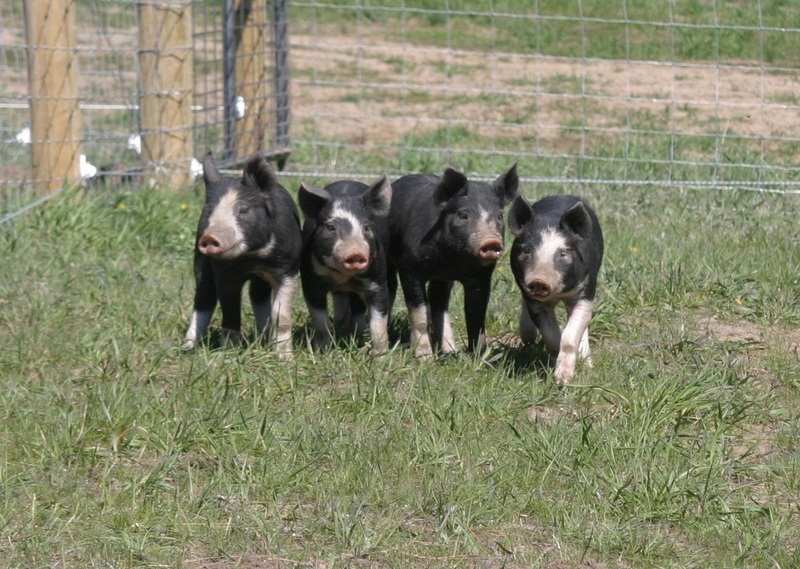 Our search for registered Berkshire breeding stock led us to Gourley Farm in Albany, Oregon. It is a great blessing to begin a program with a foundation from an established successful breeder. We are very grateful to Stan and Lorene Gourley and their son Jerry for helping us get started even though they knew of our inexperience. Lad is the sire of our first litter of pigs and will continue on as herd sire at Vintage Farm. Joan came from Tom Conover's Bonnie Acres in Iowa and traveled to Gourley Farm in Albany, Oregon before coming to Vintage Farm. She is the foundation of our female line. Bred by Tom Conover of Bonnie Acres and born at Gourley Farm. Little Joan is a daughter of BIG JOAN. She was bred to THFS2 Gary Coleman 9-6 when we purchased her and will be bred back to Lad as soon as her September 2013 litter is weaned. The Berkshires are well-adapted to being raised on pasture. We are expanding our fencing to allow more area for the pigs to roam. This is a picture taken in winter when it was about 10 degrees (F) and they seem very comfortable. Lad and Joan grazing on a cold winter day. They snuggle in the shelter at night. Replacement gilts about 7 weeks old exploring the pasture.